Elements Applied: Seeds are applied in herbal medicine. Active Components: Fenugreek’s positive action on human health originates from high content of steroidal saponins, which are primarily responsible for regulating cholesterol levels in the body. The seeds have a high content of dietary fiber, which accounts for its positive effect on diabetic individuals. History: Since the ancient times fenugreek has gained great popularity in herbal medicine. It has been applied as a medical remedy for digestive conditions, bronchitis, arthritis, abscesses, and wounds. Conventional Chinese homeopathists prescribed it for kidney conditions, and diseases impairing male reproductive function. Till the present moment Fenugreek has been considered a good spice for culinary dishes. Used For: The herb is known to reduce fevers, tone the digestive system, and reduce cramps. The range of conditions in which Fenugreek is applied includes hypertriglyceridemia, high cholesterol levels, diabetes, constipation, and atherosclerosis. Additional Info: Though the plants originates from western areas of Asia, and southeastern areas of Europe, it is nowadays cultivated across the globe, including the US, northern Africa, and India. 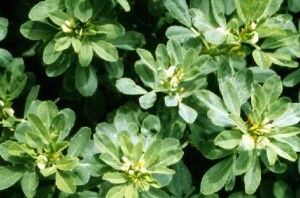 Fenugreek seeds are considered the most valuable for the herbal medicine. Preparation and Intake: Because of slightly bitter taste of seeds, tablets, which are relieved of bitter taste, are the preferable choice. The commonly taken dose ranges from 5-30 grams with each food intake, or 15-90 grams once a day. Safety: A dose of 100 grams or more a day may result in nausea and bowel disorders. But taken in normal quantities, fenugreek is quite safe.